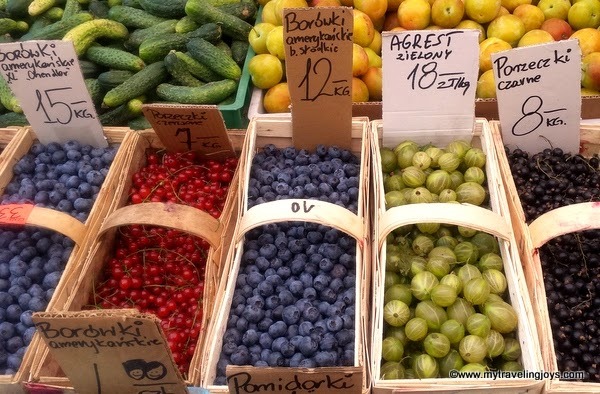 At least once or twice a week, I trek down to my local market in Warsaw so I can handpick my own fruits and vegetables. I detest the major grocery stores here except to buy dry goods like cleaning supplies, cereal or canned goods. I’d much rather buy my fresh produce from a small, local vendor than some corporate giant. 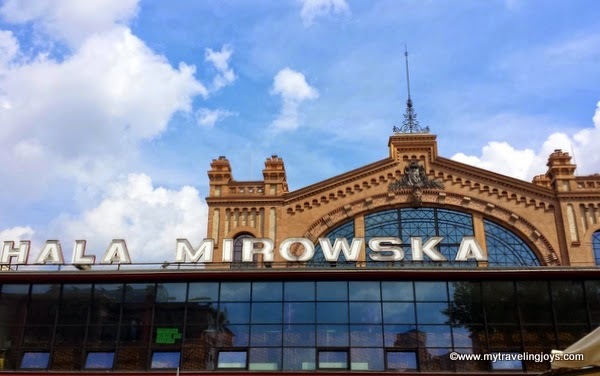 To some, Hala Mirowska may look a little rough around the edges as you’ll find its exterior riddled with bullet holes from WWII. But to me, the building’s history is just part of its charm. Originally constructed between 1899 and 1901, Hala Mirowska functioned as Warsaw’s largest market until the outbreak of the Warsaw Uprising in 1944. The building has survived bullets and a raging fire and even served as bus depot following the war, but today you’ll find that the “hall” offers a one-stop shopping experience. 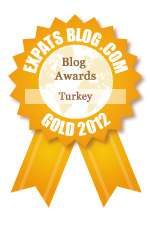 In fact, Hala, as I affectionately call it, reminds me of my beloved pazars in Istanbul. 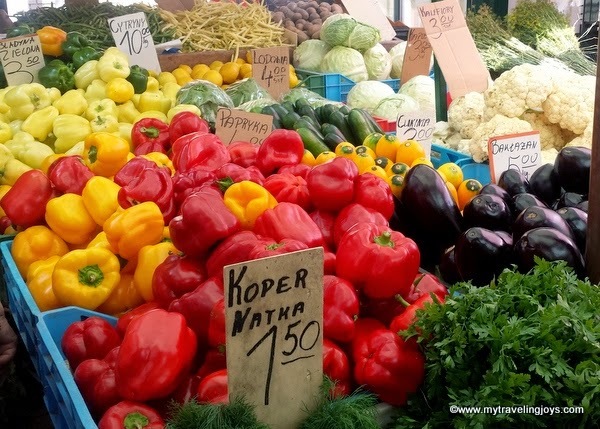 Here, you’ll find more than 50 stalls selling fresh meat, fruits, vegetables, sauerkraut, Polish sausages, yogurt, baked goods, bread, nuts, quinoa, spices and more. You can even get your watch repaired, your shoes shined or a pair of pants hemmed. You’ll find cheap dresses, shoes and even women’s underwear. There’s a small kitchen store with odds and ends including a great selection of canning jars and baking pans. There’s the egg lady on the corner who sells GMO-free and organic eggs. She’s finally warmed up to me and smiles when I ask her for my “dziesięć jaja” even though my Polish grammar is incorrect. 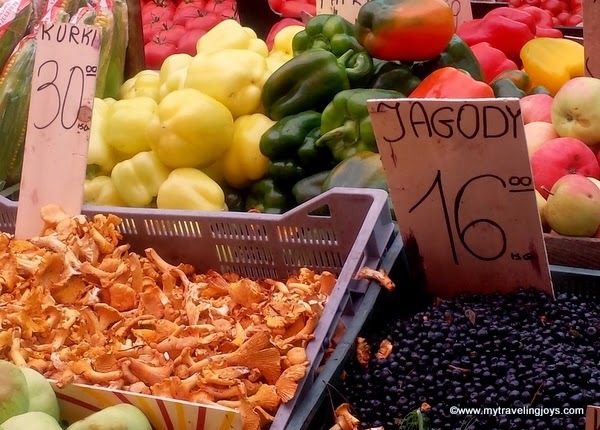 For the best market experience, you’ll definitely want to speak some Polish, but there are several stalls where the younger vendors do speak English. Of course, a smile, hand gestures and a simple “proszę” go a long way. 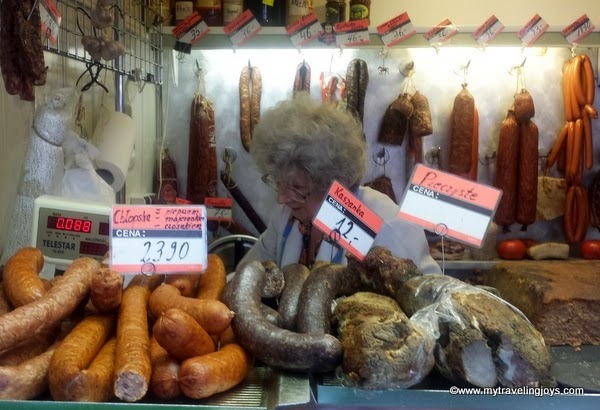 Around the corner, I stop at the meat lady for some of the best Polish kielbasa, cured meats and even her own Polish prosciutto. I’m guessing she’s about 70 years old, but still has a feisty spirit and makes everything from scratch with the help of her daughter. She's awesome! 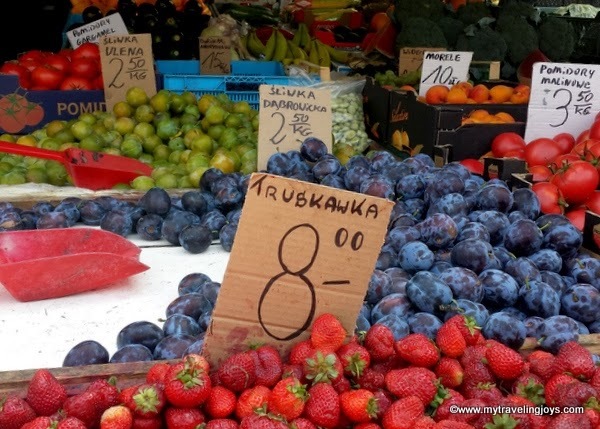 The summer months are the best time to visit Hala Mirowska. In June, strawberries and blueberries arrive. By July, all the berries are in season and it’s wonderful. In August, you’ll still find blueberries, raspberries, red, white and black currants, gooseberries, apricots, peaches and the beginning of apple season. For vegetables, you can buy tomatoes galore, colored sweet peppers, eggplants, broccoli, cauliflower, etc. Summer bounty! I just took this photo yesterday! Late summer strawberries in August. In September and maybe part of October, if you’re lucky, watch out for the Polish mushrooms. The Poles go crazy over their mushrooms, and rightfully so, as they are quite tasty! You’ll find lines of people even outside the market selling jars and plastic containers of mushrooms of all varieties. Maybe this fall I’ll figure out what all the mushrooms are! These mushrooms make the best soups! Not all the produce is locally grown. From what I understand, there is a produce wholesale market where the vendors can buy their goods and then sell them at the market. During the winter months, you’ll find root vegetables and lots of imported produce such as limes, eggplants, berries and more, which of course, you’ll pay a premium for then. But I’d still rather shop at my local market any day! 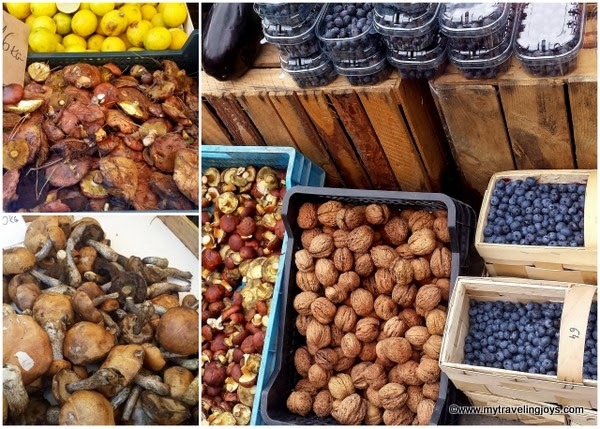 Where is your favorite market to buy fresh produce? Poland is the largest producer of apples in Europe. Earlier this month, Russia slapped an embargo on Polish produce in retaliation against Western sanctions. However, Poles are fighting back with an “#eatapples” campaign online. Homemade Polish dill pickles are delicious! 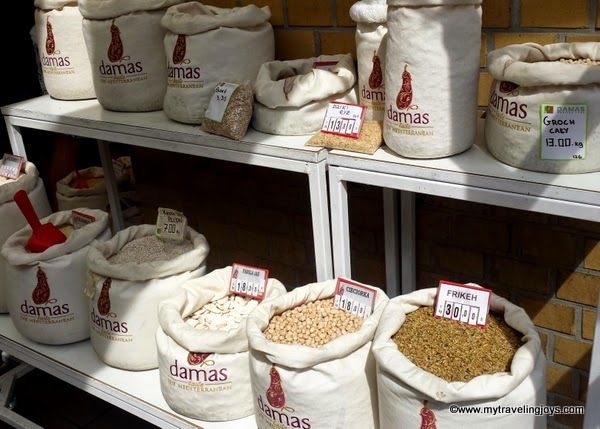 The Damas stall, number 17, sells a variety of Mediterranean goods such as legumes, bulgur, couscous, hummus, pita bread, baklava and more. 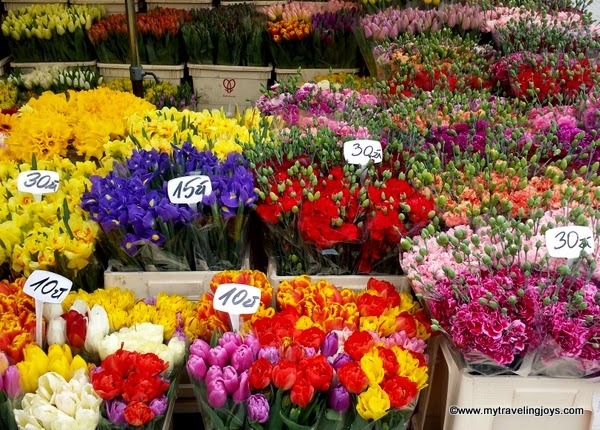 As you approach Hala Mirowska, the first thing you will notice are the plethora of flower stalls outside. i would be in heaven! and the mushrooms, oh the mushrooms!! !